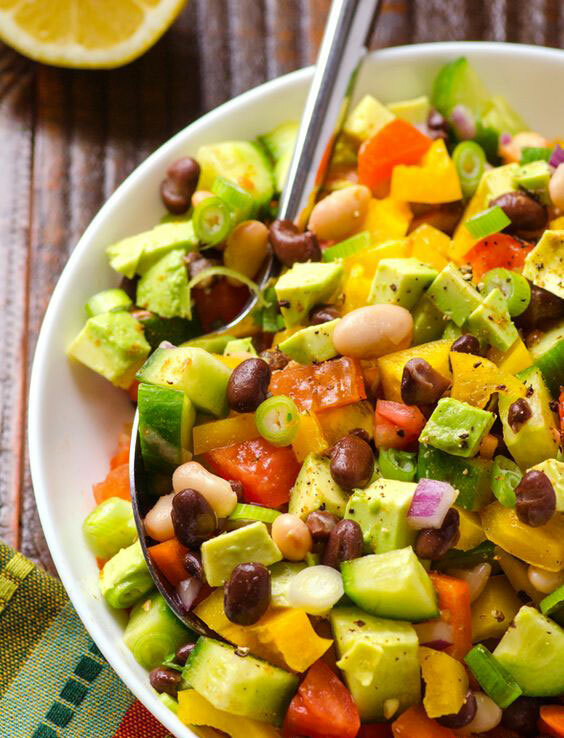 Eat Yummy, Live Healthy: 5 easy-to-make salads that you MUST try! We all know that adding a salad to your diet every day can pay off with plenty of health benefits. But who said salads had to be dull and boring? 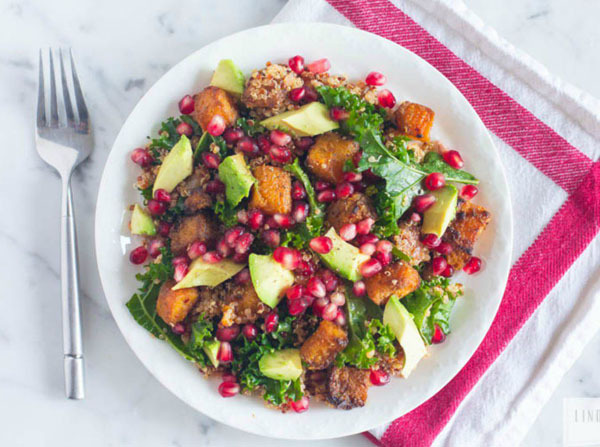 Here’s presenting our tried-and-tested exclusive selection of some delicious, yet healthy salad recipes for our readers. You can also customize these with fruits and vegetables of your choice. So head to the kitchen, bring back a bowl of salad and thank us later. 1. 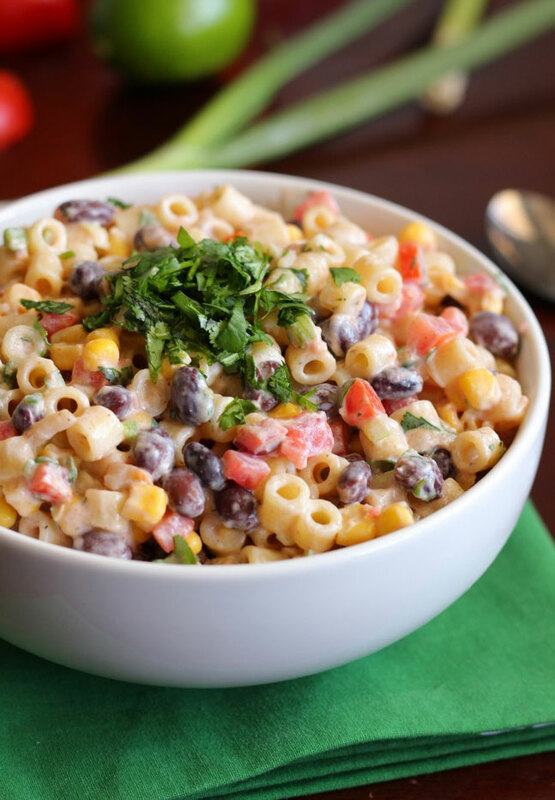 In a large bowl, combine beans, bell peppers, frozen corn, and red onion. 2. In a small bowl, whisk together olive oil, lime juice, lemon juice, sugar, salt, garlic, cilantro, cumin, and black pepper. Season to taste with hot sauce and chili powder. 1. Heat oil in a large nonstick skillet over medium heat. Add onion and corn; cook, stirring, until the onion begins to brown, about 5 minutes. Coarsely chop 1 tomato. Add it to the pan along with rice, beans, chili powder, 1 teaspoon oregano and 1/4 teaspoon salt. Cook, stirring frequently, until the tomato cooks down, about 5 minutes. Let cool slightly. 2. Coarsely chop the remaining 3 tomatoes. Combine with cilantro, salsa and the remaining 1/2 teaspoon oregano in a medium bowl. 3. 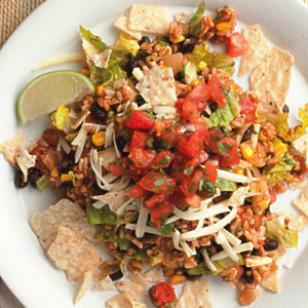 Toss lettuce in a large bowl with the bean mixture, half the fresh salsa and 2/3 cup cheese. Serve sprinkled with nachos and the remaining cheese, passing lime wedges and the remaining fresh salsa at the table. 1. In a large pot of boiling salted water, cook the corn for 3 minutes until the starchiness is just gone. Drain and immerse it in ice water to stop the cooking and to set the color. 2. When the corn is cool, cut the kernels off the cob, cutting close to the cob. 3. 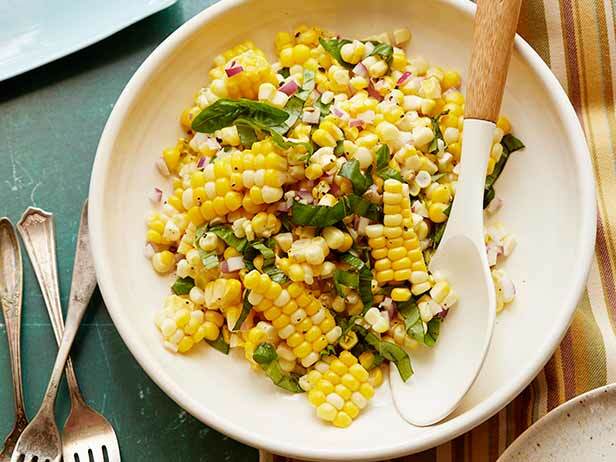 Toss the kernels in a large bowl with the red onions, vinegar, olive oil, salt, and pepper. 1. Shred carrots using the shredding disk on a food processor (or a box grater). 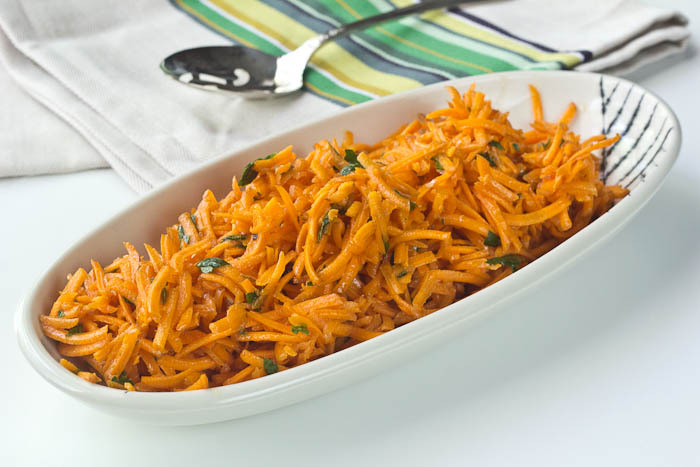 Pour carrots into a large bowl, and swap the shredding disk for the standard processor blade. 2. Add oil, vinegar, mustard, honey, and parsley to the processor and pulse until parsley is chopped and mixture is blended. Add salt and pepper to taste. 3. Pour dressing over carrots (you might not need all of it) and toss to coat. Serve immediately or cover and chill until ready to serve salad. 1. Cook salad macaroni. Drain and rinse with cold water. Rinsing with cold water will help prevent it from sticking together. Set aside and allow to cool and dry completely. 2. When dry, add the beans, corn, tomatoes, green onions, onion and cilantro. In a separate bowl, combine all the dressing ingredients (jarred salsa1, sour cream¼, Mayonnaise1 clove garlic, minced or pressed½ tsp. cumin salt and pepper1 lime juiced) and add to pasta mixture. 3. Stir together until everything is evenly coated in sauce. You can either stir the Feta cheese into the salad or use it as a garnish on top. Taste and adjust any ingredients as needed. 4. Refrigerate until ready to use. This is best served on the day it is made. Serves 8-12 people. Don’t tell us they didn’t tempt you enough?